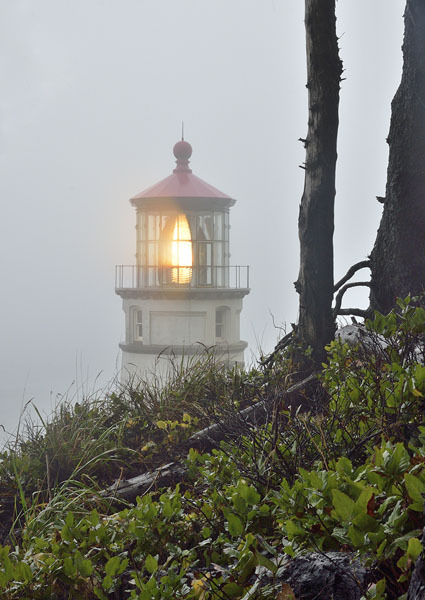 Heading farther south along Oregon’s coastal highway 101, the weather finally shifted to a more typical fall pattern – misty and rainy. 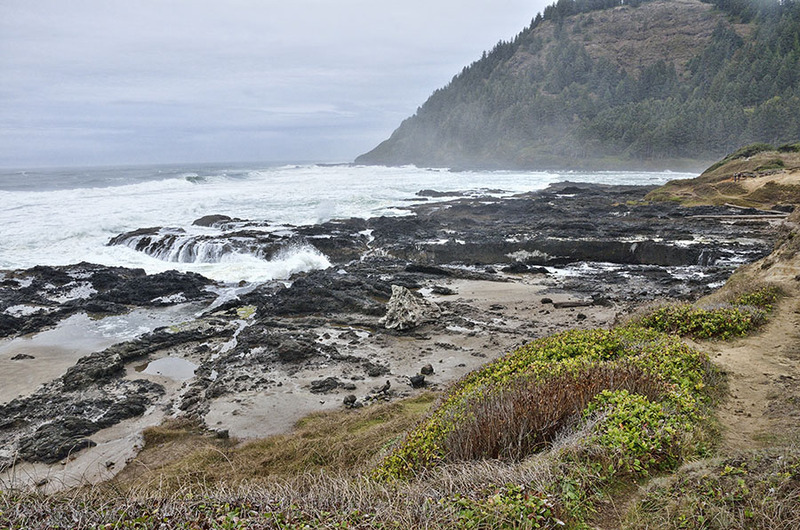 The wind picked up a bit and the conditions suited the more rugged part of the coast around Yachats (pronounced “ya-hots”). There’s a wonderful trail named “the 804” that runs right along the rocky shoreline, and you have to keep an eye on the waves if the tide is high and the wind is up – you can be swept into the sea if you’re not paying attention. 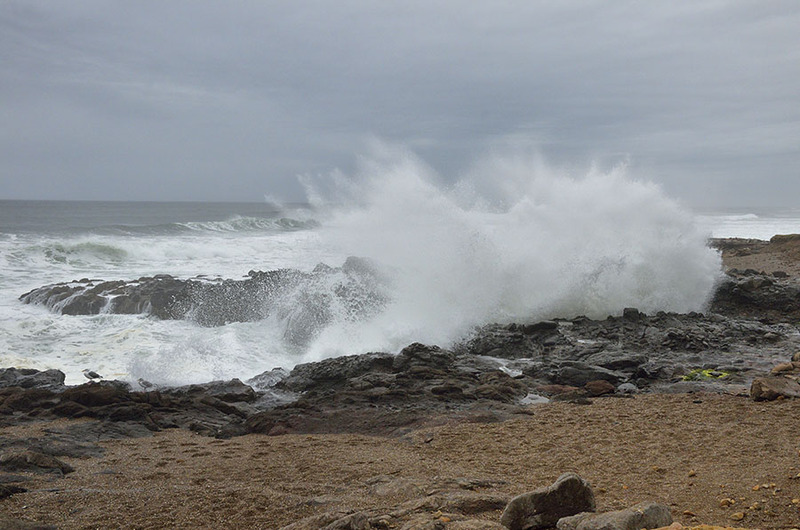 The waves crashing on the rocks were mesmerizing, and we were sometimes startled out of our reverie by the WHUMP of a big wave that you could feel in your chest. 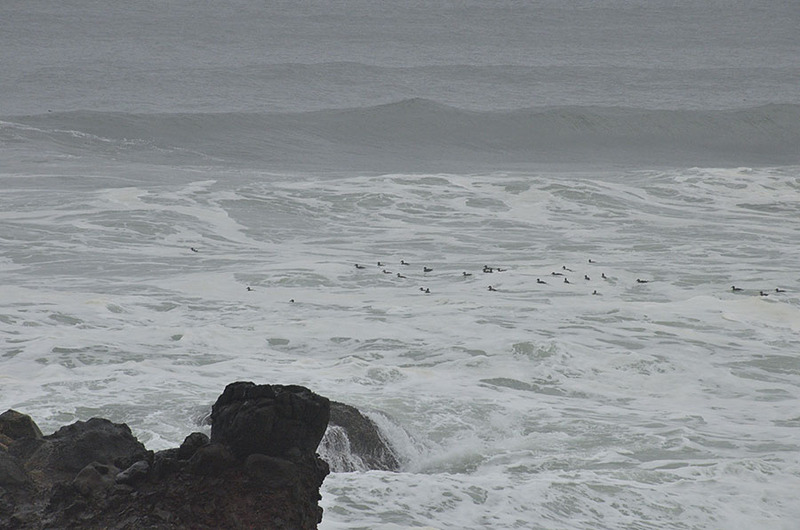 Sea birds were fishing in the surf, ducking under the biggest waves, and riding up and over the smaller ones. It took me a while to identify them correctly, and they were (no surprise) Surf Scoters. How these birds could successfully feed in those violent waves boggles the mind, but they kept at it for quite a long time. As with the rest of the coast, state parks and state recreation areas are everywhere – each a little gem with great views or a special natural feature. 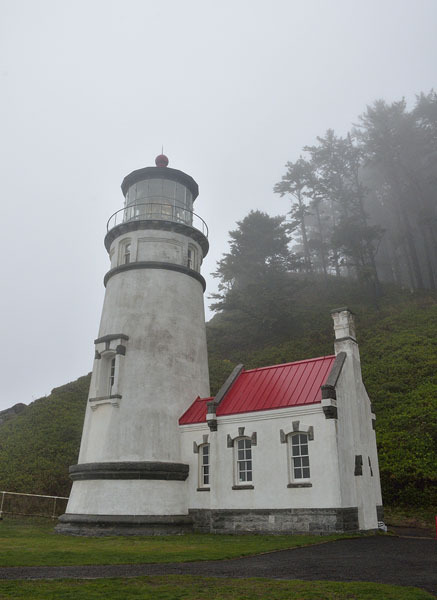 On top of that the town of Yachats was charming and fun… Just a few miles down the road is Cape Perpetua State Park, with a number of hiking trails, an interpretive center, and some awesome shoreline features. While waiting for the tide to rise we hiked to see the giant spruce tree – over 600 years old, standing 185′ tall and 40′ in circumference. 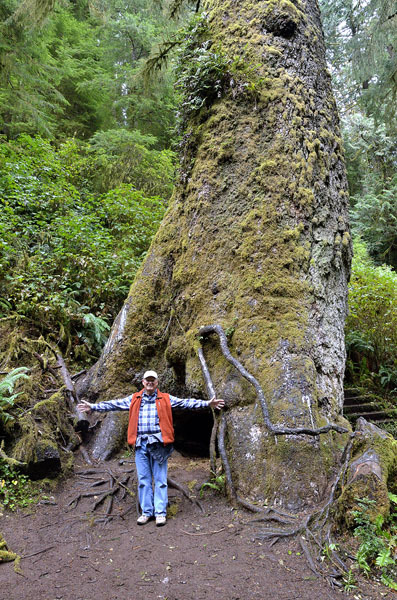 The hollow under the tree was created by a “nurse log” – a dead rotting log that provided a rich medium for a little spruce seedling to grow on, and eventually the nurse log returned to the soil as this tree became the mighty specimen that it is today. 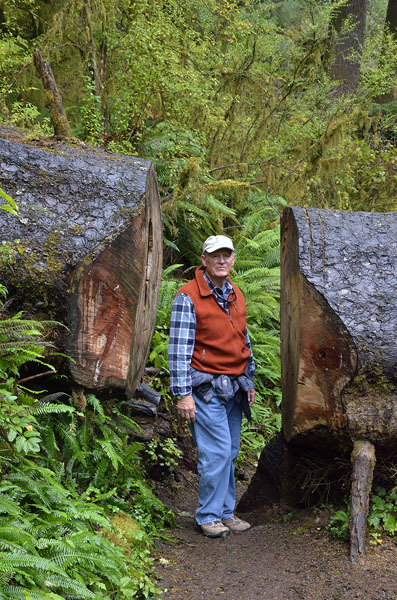 Other trees in the forest weren’t quite as big, but this one that fell across the trail was still pretty impressive. We drove up to a fantastic overlook, but the lashing rain and gusty wind made it impossible to take a photograph – we were more concerned about not getting blown off the cliff! But as the rain eased and the tide came in, we climbed down by the craggy shoreline to see the Devil’s Churn and Spouting Horn. The Churn is a long narrow rectangular cut in the shoreline where the sea foams and flings itself furiously at the rocks. There were some smaller similar formations all along that stretch, but my favorite was the Spouting Horn. 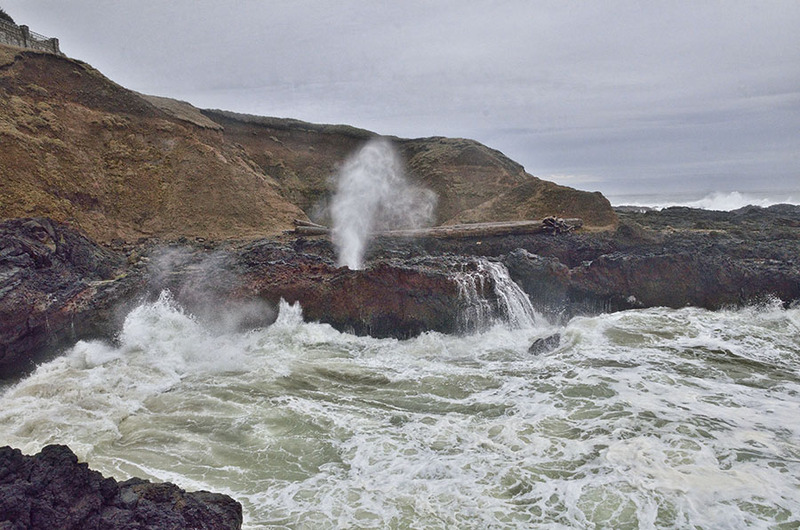 We watched the sea funnel into a narrow cut and when the waves were just right they were forced under the rocks and emerged as a violent spout of mist from a small hole. Once again, it was mesmerizing. 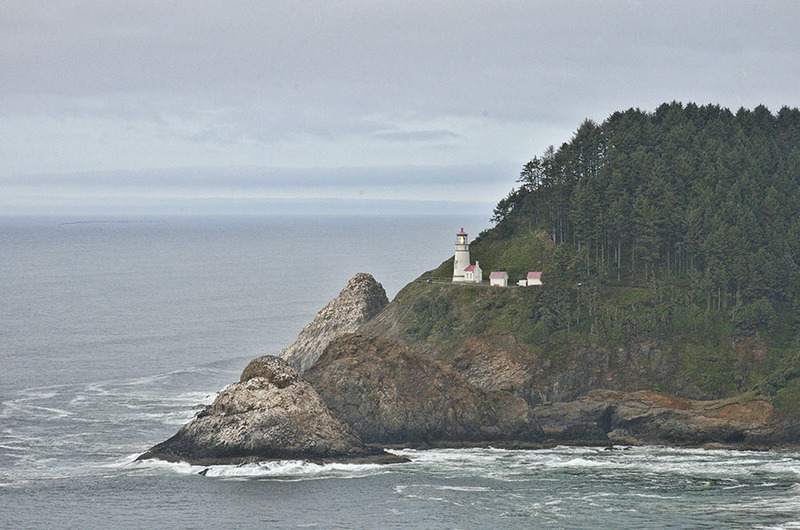 About 10 miles farther down the coast is the Heceta Head lighthouse. Horizontal rain started back up so there were very few visitors, but the dauntless volunteers were dressed in full rain gear and were happy to show us the tiny museum and explain the highlights about this particular lighthouse. We were dressed pretty well for the foul weather, so we explored the little beach below the lighthouse, trying to imagine how the builders got the materials up the steep cliff to construct it. 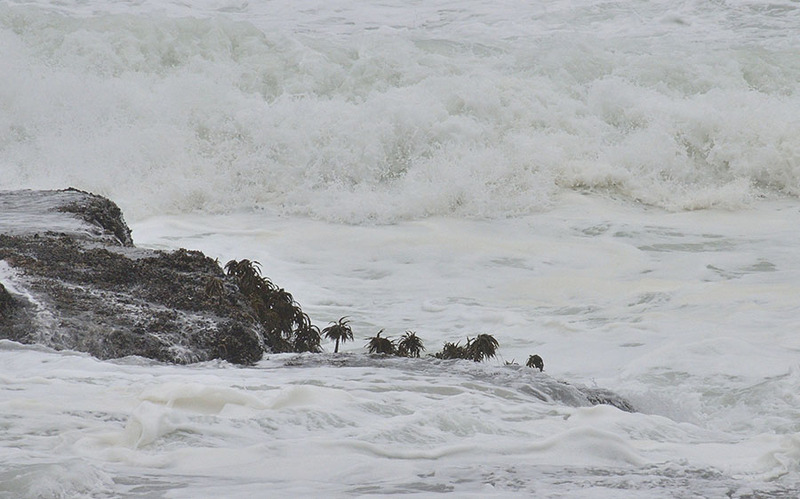 Once again, the pounding waves were fascinating, especially as they pummeled the short kelp-like sea palms. 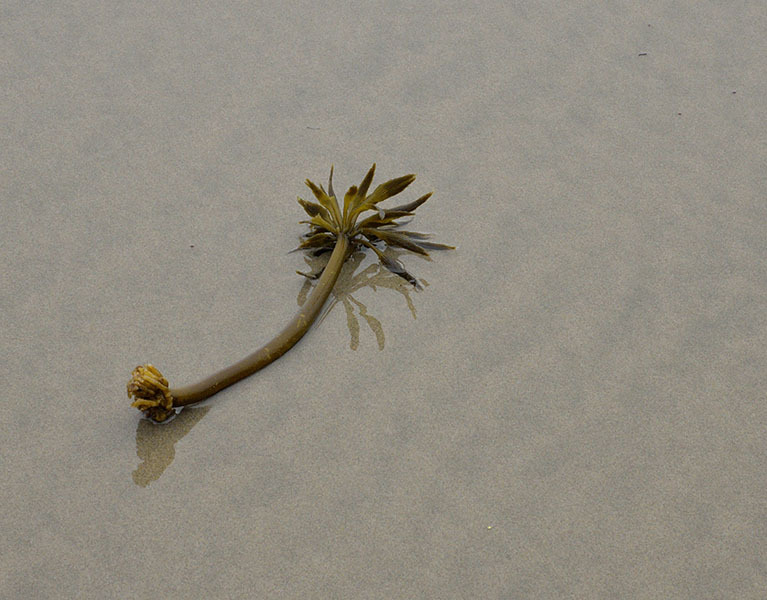 These little plants endured the most relentless assault from the sea, with tons of water repeatedly crashing on top of them, bending them but not breaking them off or tearing them loose. We finally found one on the beach that we could look at more closely, but it’s sturdy constitution defies the imagination. Thanks for reviving memories. I painted several plain air subjects in that stretch of shoreline and didn’t see nearly as much as you did. Your photography inspires as usual. Don had his turn, now it’s my turn! Wonderful evocative photos; and we had the exact same weather when we were at that Light house. The waves? ?They could be felt through the soles of your feet.. I WANT TO PAINT THEM!! To me , they looked positively joyous crashing thru the foam of a wave and disappearing in the surf. 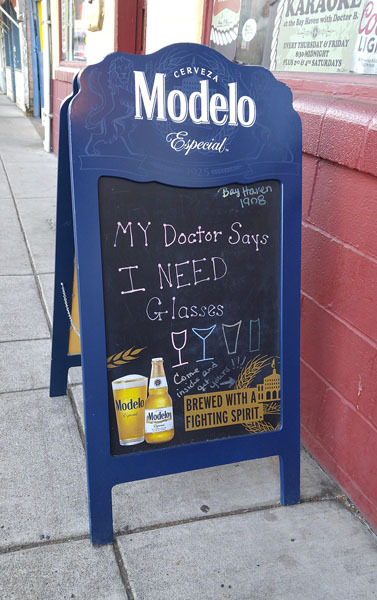 Do you have any close-ups of them doing that? Love your interpretation of how you see the wonders of this world, an artist thru and thru.